The concept of ARES Kudo was introduced by Robert Graebert, CTO of Graebert, at Graebert’s Annual Meeting four years ago, in Fall 2013. Graebert’s cloud-based CAD solution was first renowned for its collaboration with Onshape®, the first full-cloud 3D MCAD solution. The 2D module Onshape Drawing, released in September 2015, is, in fact, a custom version of ARES Kudo. Twelve months ago, Graebert announced the phased rollout of the first version of ARES Kudo for its subscribers as part of a unique concept: The “Trinity of CAD”. For Graebert’s end-users, ARES Kudo is indeed fully interconnected with its other CAD platforms for desktop (ARES Commander for Windows®, MacOS® or Linux®) and mobile (ARES Touch for Android® and iOS®). The three solutions are bundled into a unique subscription. This allows users to take advantage of each platform with similar features but different use cases. ARES Kudo and ARES Touch are therefore coming at no additional cost for the subscribers of ARES Commander. 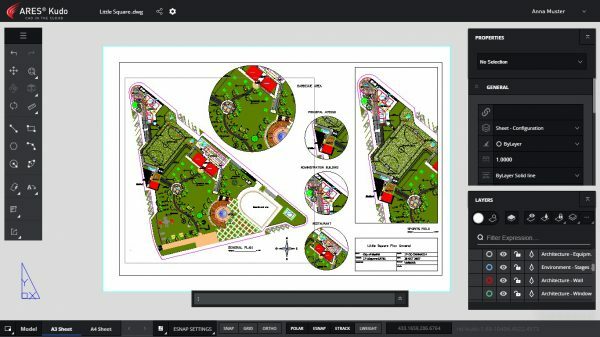 Our Cloud-based Solution is also offered to developers as a Cloud-based platform for DWG-viewing and editing. Besides its extensive set of ready-to-use DWG editing commands, ARES Kudo offers an easy path for developers willing to migrate their Windows-based applications to the Cloud. ARES Kudo’s programming interface supports indeed programming languages, that are widely used by the developers of CAD applications such as C++ or Lisp. Instead of introducing another cloud storage service, ARES Kudo offers the opportunity to become the “hub” for all DWG drawings. Users are invited to connect their existing cloud-storage (which includes the most popular solutions such as Box®, Dropbox® or Google® Drive) but also to vertical, industry-specific solutions. Users may, for example, access drawings stored on the servers of Onshape® or Trimble® Connect. With ARES Kudo you can connect several of these cloud storages and search for DWG files in all of them simultaneously, before opening the file for viewing and editing purposes. ARES Kudo avoids all the hassles of installs and updates. Users can log in from kudo.graebert.com and instantly access all their drawings. The integration of ARES Kudo with ARES Commander and ARES Touch helps to synchronize the files from one device to the others and across all the users collaborating around a project. Projects can be shared as a simple URL. This includes also the ability to share a view-only link with external users. View-only links represent a disruptive and very easy method to share drawings. Such a URL allows the owner of a drawing to let other people see the drawing online. Being updated instantly when modifications are saved they avoid any risk of outdated information and represent the single source of truth of the project. Graebert further emphasized ARES Kudo is aiming at making no compromises in features. Most of the features available in ARES Commander for 2D are already migrated. ARES Kudo will soon support the ability to read other file formats such as Bentley® MicroStation®’s *.dgn files or Autodesk® Revit®’s *.rvt files. Besides editing DWG files, ARES Kudo has, therefore, the ambition to be the viewer and hub for all the files of a project. Graebert is also actively building ties with other communities of users. The integration with Onshape and Trimble Connect is aiming at strengthening the competitive advantages of the ARES Trinity of CAD software among these two communities of users and Graebert will look forward building more similar integrations. This year we are offering the possibility to try (30 days free trial) the new features of ARES Commander 2018 immediately by downloading our pre-release for Windows (no Mac or Linux pre-release version yet). Graebert is a leading developer of CAD software, solutions, and services. We are recognized as a true innovator in the CAD industry and have more than 30 years of expertise. Our DWG-based CAD systems were the first to run on Windows®, Mac®, and Linux®. Graebert is also a pioneer in mobile CAD technologies on Android® and iOS®. Most recently, Graebert introduced ARES Kudo, a full DWG-based CAD platform for the Cloud. 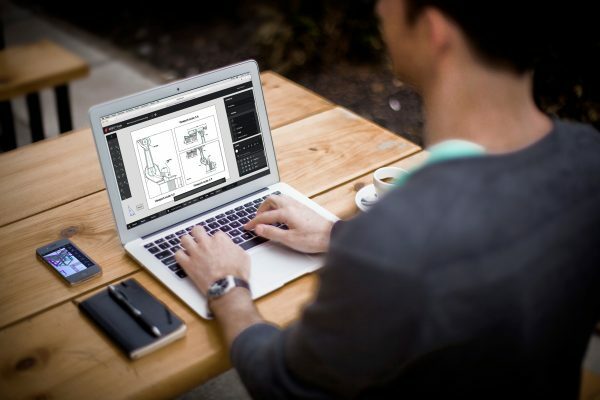 Graebert‘s product portfolio is anchored by the ARES Trinity of CAD software – a powerful suite of DWG-based CAD software for desktop, mobile, and cloud – which also enables developers to create standalone CAD applications. The three solutions are bundled into a unique subscription allowing users to take advantage of each platform with similar features but different use cases. Overall, millions of professionals use our CAD technologies in more than 100 countries. We also specialize in building surveying software and services. The SiteMaster™ line of “as built” surveying solutions, as well as worldwide surveying services are included under Graebert‘s iSurvey™ brand and division.